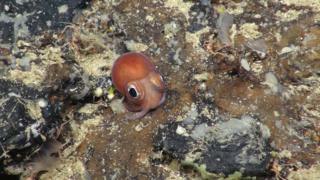 Scientists have been taking samples of deep-sea marine life to find new ways of conserving ocean species. The team, from Plymouth and Oxford universities, have been based on the research ship James Cook for the last six weeks. They say the genetic fingerprints of marine life could suggest how to identify areas which are most in need. The research project called Deep Links found amazing sea life amongst a lot of manmade rubbish. Deep Links researchers used a remotely-operated submarine to explore depths below 200m (656ft) around the North Atlantic and collect corals, sea urchins and sea cucumbers. They also found trawl marks, fishing line, trawling gear, tin cans and plastic cups. Dr Kerry Howell, marine biologist from Plymouth University's School of Marine Science, said: "The sea provides lots of services to us, regulating climate and recycling nutrients and supporting our fisheries, so it's important that we manage this area well."